For a United Front to defeat the offensive of the employer, the government and the right! Volkswagen metallurgical point the way of the fight! 2015 began with the working class coming under intense attacks from the government and employers, with threats of massive layoffs of in VW, Ford, Mercedes, with threat to unemployment insurance, sick pay, pensions, wage allowances, etc;. We also say outsourcing of medical skills, higher taxes, lack of mains waters and curs electricity supply in the working class neighbourhoods. 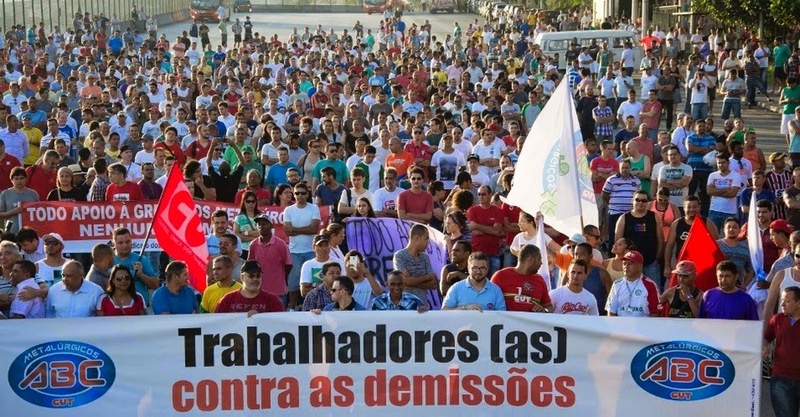 In its fight against the employer offensive, which aimed to dismiss 800 workers, Metallurgical VW bypassed the trade union bureaucracy policy and put thousands of protesters to halt the Anchieta Plant , along with the workers of Ford and Mercedes. The example of this historic and symbolic victory of a major portion of the Brazilian working class shows that the left must resume more effective fighting methods and adopt combative attitude towards Rousseff ’s austerity policies. Although, conducted by the trade union bureaucracy, the victory won in this battle has only been partial because it accepted the imposition of the PDVs (voluntary resignations plan) and the resignation of subcontracted workers. Rousseff and the PT won supported by a popular base very afraid to see their rights suspended for a possible election victory of the traditional right. But under pressure from the right Dilma adopts the program defeated at the polls and believes that by giving in to the demands of finance capital and the bourgeoisie, she will disarm the forces that threaten a coup. The tactic is to attack the rights won by working class and govern for four more years without a legal parliamentary coup armed by the private banks with the support of the mainstream media. The right exploits the fragility of the new PT government, and has been exposing the myth of capitalist government without corruption and the farce that the economic crisis would only be a “small wave”. While Rousseff has exhausted her own political capital, the right seeks to acquire popular support away from openly coupists groups because their tactic is via impeachment legitimized by street demonstrations amplified by the mainstream media, as recently occurred in Paraguay and Ukraine. Even opponents of the PT policies, several leftist organizations mistakenly believe that Dilma’s capitulation will dissipate the risks of an attack and that, therefore, it is not necessary to fight the right with a strong united anti-coup front. This mistake can be very costly to the left in general. The tactic of the internalisation of the policy of the right only serves to pave the way for reaction and has no effect against the coup. How come? Because even the most neoliberal economic policy to be applied by Dilma not solve the current problem in the US, located by the new cold war world, where imperialism tries to contain the growing economic influence of the political and military bloc of countries led by Russia and China. The threatening coup in Brazil is mainly a product of this new international situation arising from the need of the US to regain its Latin American backyard. This they seek to do by deposing the PT government (because they are collaborators with their international BRICS partners who advocate of de-dollarization of commercial transactions) and replacing it by a typical right-wing pro-imperialist government. Knowing the right-wing dynamic in both the streets and in the highest authorities of the state (Congress, Supreme Court, federal police and prosecutors), Lula agitates the MTST (the homeless workers' movement) to convene a kind of “popular front of masses” to try to compete with the right wing on the streets and to shield Dilma a little and prepare his own candidacy for 2018. 2) demonstrate to the big banks and private corporations they still need the PT to govern without a social crisis. We, the Joint Committee call on the workers organized in the social movements, groups, collectives and parties of left in this meeting to go out from here with united front against anti-proletarian policy and Dilma in combat right and extreme right organizations. We have no illusion in the new Popular Front which demobilises the social movements to ensure the effectively management of capitalism. We believe that this united front must embark on a unified national programme of strikes and unrest in the streets, playing them inch by inch against the right-wing and the bosses. The united front against the right must coordinate the struggles against mass layoffs in the industry categories and other sectors of essential services (rail, subway, bus), with popular movements struggling for housing (FIST, MTST, MNLN). At the same time, the United Front itself will be able to give a qualitative jump in the organisation of the popular movements by coordinating events, and thus it will able to repel any attempt to influence or hijacking the agenda of workers’ aims by the onslaught of right-wing media. They use their ideological instruments known encourage the conservative middle class and by infiltrating right-wing elements into the left demonstrations. The Anchieta plant in São Bernardo do Campo, less than 30 km from São Paulo. It is the main plant outside Germany and it is also the seat of the headquarters and the Development department of Volkswagen of Brasil.